Blame it on birth order, genetics, or what have you, but while everyone else around here is content to have the sniffles and sneezes, I have to push it to the next level: bronchitis. “It’s a really close call between pneumonia and bronchitis,” my doctor commented as she listened to my inflamed lungs, “I’m going to call it bronchitis.” She quickly added, “what took you so long to come in?” Well, apparently I think that I have to be nearly dead before going to the doctor. This is mostly likely do to the mild case of hypochondriasis that I had as a child. I’m so terrified that the doctor is going to say, “your fine, it’s all in your head” that I don’t even believe my own symptoms. Oh, I’m only a little out of breath and sure my voice sounds like a squeaky toy, but I can still teach Sunday school. Oh, I’m not coughing that much. 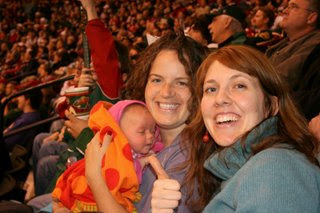 I can go to hockey game, cheer my heart out, and talk my friends ear off, not to mention hold her six-week-old baby. Thumbs up, Rach, you are infecting 18,000 fans! You crack me up! I hope you feel better soon! Oh Rachel! I hope you feel better soon. ha ha 🙂 you don’t look the least bit sick. i’m glad you had fun even though you weren’t feeling the best. I hope you are feeling better soon, Rachel! Ugh. The LONG, funny (?) comment I just created got lost on it’s way to being posted. Bummer. We’re still not sick, so perhaps you didn’t “infect” us after all! I think we’re sorta similar. If it’s any indication of how often I go to the dr when I’m sick I don’t even really have a “regular” dr. I went once to one place about 3 years ago when I had what they thought was an ulcer or gall bladder problems. Turns out I just hated my job! Anyway, I hope you’re better real soon. Spoil yourself with some Christmas goodies!